Teton County Search and Rescue was started in 1993 by the Teton County Sheriff's Department to provide vital emergency search and rescue services for Teton County and surrounding areas to those in need. The TCSAR Foundation supports TCSAR volunteers through direct support, community education and advocacy. Together, we create an organization that works to keep Teton County residents and visitors safe in the backcountry 24 hours a day, 7 days a week. After eighteen years, Paul returns to the Totem Pole to find out if he has recovered enough to finish the climb. The Alpine Village welcomes you throughout the weekend, from Thursday 5th evening until Sunday July 8th, Place Balmat, Chamonix. Every day is stacked with free-for-all activities such as inspiring open-air master classes, athletes’ coached sessions and demos at the bouldering and climbing walls, world premiering movie night, live gigs and much more! 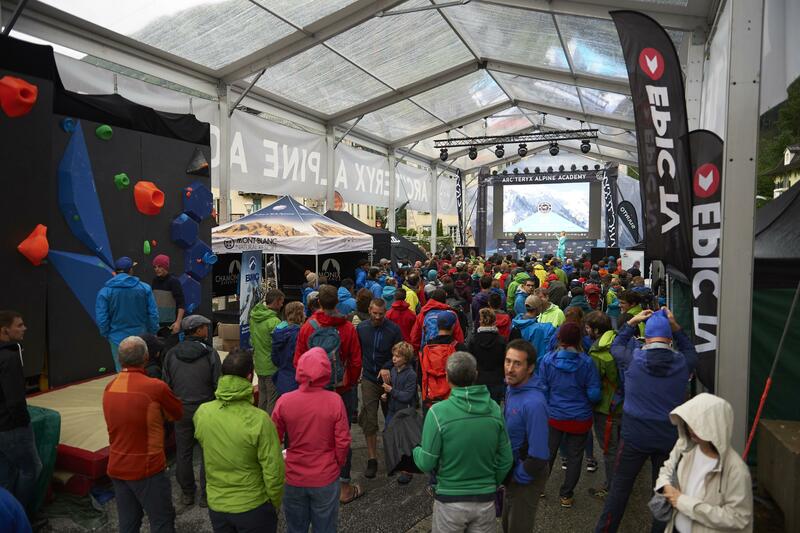 Inspiring activities run all day also at the Arc’teryx and Academy partners’ stands. Drop by to test the latest gears and equipment on the market, and even get your apparel fixed at the Gore-Tex® Repair Centre for free! Another highlight is the Arc’teryx photo exhibition paying homage to the Chamonix valley with the most stunning scenery shots curated by Academy’s finest mountain photographers. All frames are for sale during a silent auction and the proceeds will be donated to the local charity “En passant par la Montagne”. Come bid for a masterpiece and a good cause! Led by professional adventure photographer Liam Lonsdale, this master class will cover tricks and tips of shooting with a phone. A mobile workflow for editing, storing and sharing photos as well as hacks for being more creative within the constraints of your gear. The well-experienced climbers Nina Caprez and Nico Favresse share their passion of climbing multi pitch routes and offer a glimpse into the vertical life on a big wall. Have you heard of the ascents of the Eiger North Face and the "Odyssée 8a+"? Did you plan an adventurous expedition to Baffin Island? Robert Jasper will take you on a unique journey talking about history, modern climbing and some exceptional challenges during his past trips! Using climbing as a narrative, Mina will explore the concept of determination and its application in the pursuit of far reaching goals. Dreaming big in life often comes with uncertainty and in this session she’ll delve into the process of harnessing the necessary drive to flourish. Stunning shots, incredible stories and amazing athletes – this year’s movie night features four breathtaking short films, including the world premiere of the "Empire of Winds." And the best part: Our athletes will be on stage and give you more insights on their trips! Headliner this year is the world premiere of “The Empire of Winds”, a film featuring the two adventurous skiers Thibaud Duchosal and Johannes Hoffmann. In collaboration with Eye Of The Storm Production, the short film takes viewers to their 1500km journey through the deserts and mountains of Patagonia. This incredibly touching film follows world-renowned ultramarathon runner Adam Campbell on his road to recovery after a near fatal fall. The film was honored with the Vancouver International Mountain Film Festival’s (VIMFF) award for “Best Mountain Sport Film”. Skiing pro Silvia Moser takes us to her home playgrounds in the Dolomites! Get inspired by locals and discover parts of the beautiful Italian Alps like you haven’t seen it before. Inspirational movie project with Nina Caprez, friends and Greenspits - an association aiming to involve the climbing community around the current issues concerning their playgrounds. Join the five climbers sharing motivation and betas at "Crespin" Rock a newly developed crag in France. EFFIGIE is an electronic music duo from Lyon formed in 2017. With four hands and one voice, the group creates a space filled with images and sensations, at the border of each dimension. Overgrass is a swiss band with who find the inspiration from the 60's and 90's rock'n roll and their british rock from Cool Britannia culture. No more rope, no more stake ... Nothing that kept her from frolicking. Poor goat! From seeing herself so high up, she thought herself at least as big as the world ... Goat At The Edge is gathering four friends, all of whom have very different musical backgrounds, with the idea of offering an experience between alternative and electronic pop music. Electronic and melancholic sounds, the group evokes nostalgia, neurosis and fear while keeping this discreet optimism. Between the shadow and the light, the two artists play on this duality servant thread to their music. Bear’s Towers, a pop folk band, is composed of four members. They have decided to give up their own band that the two styles were opposing, punk music and pop rock music, in order to blossom in an acoustic warm world feeling like camp fires and varnished wood. Wyoming’s remote and vast wilderness provides the perfect canvas for Alpinist’s Kim and Julia to redefine preconceptions of the feminine. Headliner this year is the world premiere of “The Empire of Winds”, a film featuring the two adventurous skiers Thibaud Duchosal and Johannes Hoffmann. The short film takes viewers to their 1500km journey through the deserts and mountains of Patagonia. MORE DETAILS ON THE PROGRAM COMING UP SOON! For any inquiries regarding the Arc’teryx Alpine Academy 2018, please contact academy@arcteryx.com and we will get back to you as soon as possible.